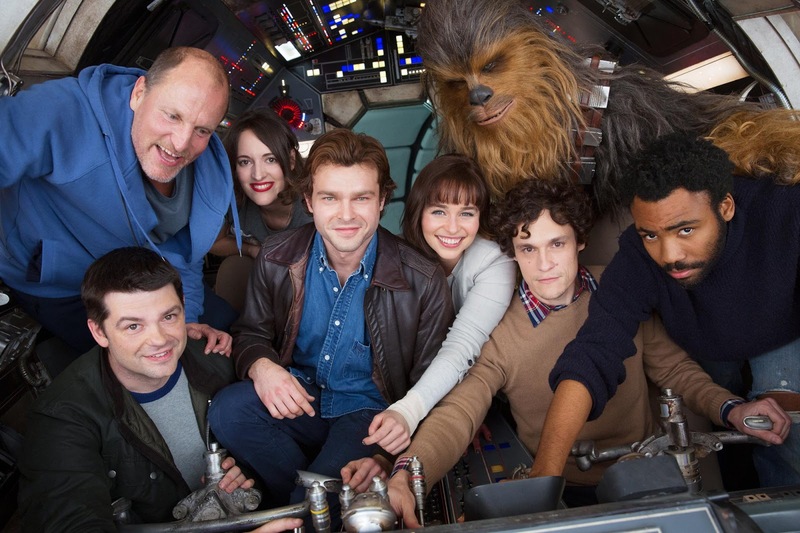 Looks like we've had our first major leak from the set of the upcoming untitled young Han Solo A Star Wars Story film. TMZ has just posted twenty three images from the set of the film, giving us a look at some new ships for the film, some extras in costume, and a look at the man himself, Alden Ehrenreich in costume as Han Solo. We've selected a few of our favourite images to highlight below. The pictures don't seem to give away anything major about the plot, but if you are trying to avoid all Star Wars spoilers then stop reading now. This is your SPOILER ALERT! Personally, I get a real drag racing vibe from some of the images. It does seem like the sort of idea George Lucas would have, to have Han Solo as a gearhead who loves speed and racing. And, for what it's worth, Star Wars publishing from the past few years has been establishing Han has some affinity for ship racing (he takes part in a dangerous race as a mission for the Rebel Alliance in the Han Solo comic and goes into ship racing full time following the fall of the Empire, as seen in the novel Bloodline). It would be a neat bit of interconnectivity between the stories to have Han's interest in racing be established in the film (though it seems he won't be racing spaceships as he does in the publishing content, but rather speeders of some kind). The look of the speeders is very cool. Sticking with George Lucas theme, they have a very American Graffiti vibe (again, suggesting they would be used for racing). If this is a racing sequence, it will be interesting to see how it differs from the podrace in The Phantom Menace. (And, of course, it makes sense that Han wouldn't be podracing, seeing as Anakin Skywalker was the only human who could do it). As for the shot of Alden in action as Han, it looks good. I can't wait to see that costume when it's properly lit in the film (or in publicity shots).